Zhan Wang, Artificial Rock No. 43, 2008. Stainless steel. Private collection. 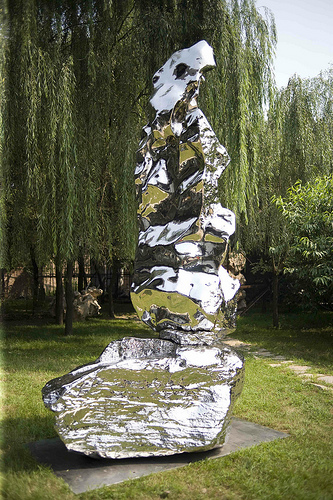 Image courtesy of the artist and Long March Space, Beijing. This work is in the "On Site: Zhan Wang" exhibition at the Milwaukee Art Museum this summer (2011). When one exhibition closes, another always opens. While I’m bummed that Frank (are we allowed to be on a first-name basis after my exhibition Express Talks and school tours?) is leaving the Museum after May 15, I am so excited for the epic series of upcoming exhibitions included in the Summer of CHINA! You might have heard about this endeavor: the Museum will have no less than five–five!–exhibitions that feature thousands of years of Chinese art, all in one place here at the Museum. (You can read all about them in the press release.) Right now, as I’m studying The Emperor’s Private Paradise: Treasures from the Forbidden City exhibition catalog, I thought I’d give you all a sneak peek as to some of the things that happen around here before an exhibition opens to the public. For the curators, it’s a process years in the making. Exhibitions are proposed, debated, and approved long before staff thinks about logistics of loans and artwork transportation and installation–ideally about 2-3 years in advance! Curators either propose exhibitions centered around their own research or the Museum’s permanent collection, or they receive exhibition packets from other museums around the world. The curators as a team meet to decide what exhibitions they want to pursue, and their thoughts are then shared with the Museum’s Senior Management team. 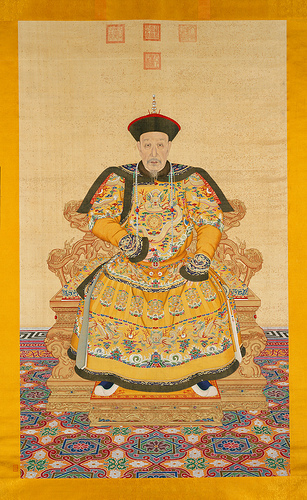 Portrait of the Qianlong Emperor. Ink and colors on silk. 99 ½ x 59 inches. (c) Palace Museum. This work is in "The Emperor’s Private Paradise: Treasures from the Forbidden City" exhibition at the Milwaukee Art Museum this summer. Next, the curator makes a formal presentation to the Exhibitions Committee of the Board of Trustees, who discuss the show’s feasibility and give (or deny) final approval. Once an exhibition is approved, the work is just beginning: the curator-in-charge of the show acts as the main “storyteller” of the objects and themes presented. They teach other staff the material, help the development department raise funds for the exhibition, brainstorm advertisements with the marketing department, and generally make sure that all the departments understand its story and ideas. About a year before the exhibition, curators, educators, marketing staff, development staff, events staff and store staff get together for a Program Planning meeting. This is where it all begins–we all get to hear about the story of the exhibition from the curator, then we brainstorm programs, events, marketing strategies, funding, and store tie-ins for every aspect of the show. In this way, we keep communication open and everyone gets a sense of the key messages and events that surround the exhibition. The Communication team creates the designs for all marketing (this can include magazine ads, websites, sometimes even billboards!) as well as pins down the key talking points. They are careful to balance the story told by the curator and the needs of sponsors with presenting the exhibition for greatest public appeal. With the five exhibitions in the Summer of CHINA, the Marketing staff had an extra challenge: how do you market not one but five shows all at the same time, giving equal draw to each of them? They also make sure that the message is consistent across all of the ways that they, and the rest of us at the Museum, communicate. This means sending the same key points to press, to visitors to our website and in person, about our programming, and by word-of-mouth. Liu Guosong (Native of Yidu, Shandong province, b. 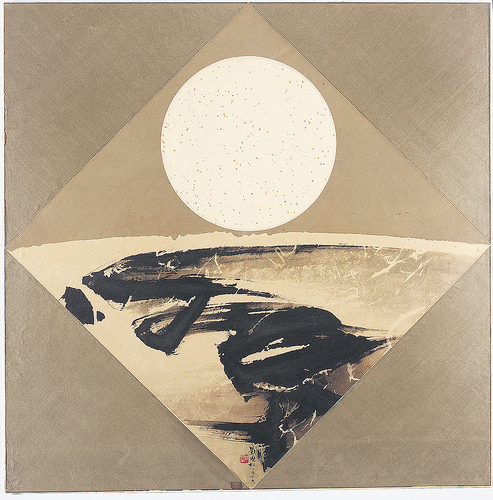 1932) High Noon, 1969 Ink, color and collage on paper. Chu-tsing Li and Family Collection. Photographed by Ken Howie. This work is in the "Emerald Mountains: Modern Chinese Ink Painting from the Chu-tsing Li Collection" exhibition at the Milwaukee Art Museum this summer. By the way, as all this is going on, Curatorial staff is working with the Registrar’s office, the Conservation team, and the installation team to coordinate how the objects are getting to the Museum, when and where they’ll be installed, what special mounts and equipment will be needed, and what everything will look like. They even get as detailed as what paint color the walls will be! In Education, we work with staff across the Museum to tell the curator’s story and to get visitors as excited about the objects in the show as we all are. We plan public lectures by leading experts in the field, Gallery Talks, school and group tours, and kid-friendly programming like Open Studios, Sketching in the Galleries, and Family Sundays. One of my favorite parts of this process are the phenomenal Docent Lectures that the Education department organizes for our enthusiastic, devoted docent corps and any interested staff members. These volunteers–hundreds of them!–come together every Thursday morning for edification from lecturers from Milwaukee and around the nation (sometimes even internationally!). These professors, collectors, and historians share their unique points of view so that the docents have even more background information about the objects to share with visitors on the hundreds of tours they’ll give. Personally, I’ll be working most deeply with the Summer of CHINA exhibitions for our teen programs. I’m teaching Art Xpress this summer, a program in which high schoolers design and create a mural for a Milwaukee County bus inspired by art at the Museum. To prepare, I’ve been attending all the docent lectures, but also thoroughly reading the exhibition catalogs. I even took a trip to the Metropolitan Museum of Art to see one of the exhibitions, The Emperor’s Private Paradise: Treasures from the Forbidden City, while it was there. Let me tell you, it’s going to be beautiful! The catalogue for this show is gorgeous, and the objects are sumptuous and beautiful. I’m also loving watching some YouTube lectures on this exhibition from the Met–like the one below, where you can get a sneak peek of a virtual tour of the Qianlong Garden! So there you have it: just a sampling of everything we do at the Museum to get ready for a feature exhibition (or five!). As you can imagine, we are all thrilled to finally open the Summer of CHINA to the public on June 11, 2011. Hope to see you then for all the festivities! Chelsea Kelly, the School and Teacher Programs Manager, oversees school tours, special K-12 programming, and events for teachers at the Museum, and also creates resources for educators about the artworks in the Museum’s Collection. This entry was posted in Behind the Scenes, Education, Exhibitions and tagged Behind the Scenes, Chinese Art, Exhibitions, Summer of CHINA, The Emperor’s Private Paradise: Treasures from the Forbidden City. Bookmark the permalink.